The legislation demonstrates the government's weak hold on power and will put asylum-seeker policy at the forefront of campaigning ahead of elections that Morrison wants to hold in May. He has ruled out calling a snap election on the refugee issue. Morrison said he would repeal the "foolish law" if his government were re-elected. Refugee advocates applaud the law that they regard as a more humanitarian approach toward asylum-seekers. The Senate passed similar amendments on medical evacuations despite ruling party objections on the last day Parliament sat last year. 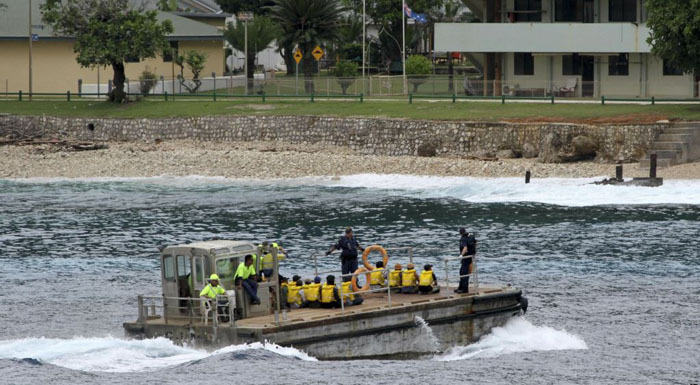 Hundreds of asylum-seekers who have been allowed into Australia for hospital treatment have received court injunctions that prevent their return to the islands. Sick asylum-seekers often have to fight the Australian government in court for permission to be transferred to an Australian hospital. Law firm Maurice Blackburn welcomed the law change. "It should never have had to come to this point, but it is evident this bill was urgently needed to force action," lawyer Jennifer Kanis said in a statement. "In the last year alone, we have had to take court action repeatedly to help secure the medical evacuation of 26 ill people on Nauru, many of these children." Home Affairs Minister Peter Dutton said he expected more boats to head for Australia in treacherous voyages that sometimes end in tragedy. "There is no question that people smugglers will be hearing very clearly that the policy in Australia has changed," Dutton said. "This puts Australia back on the map for people smugglers and Bill Shorten has that on his shoulders."